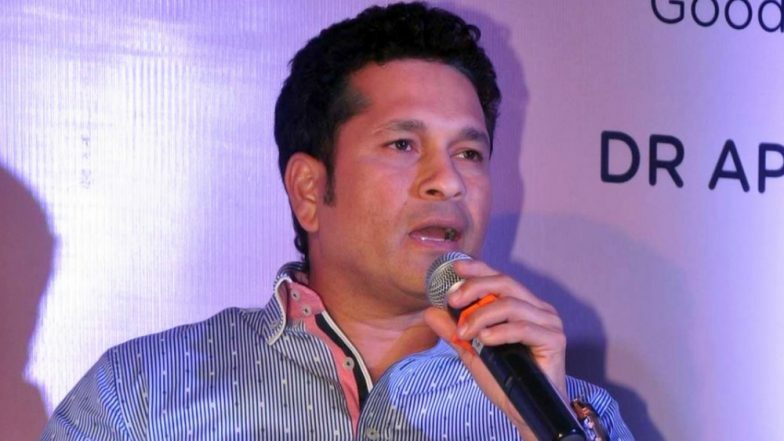 Mumbai, April 8: The Tendulkar Middlesex Global Academy (TMGA) on Monday announced the schedule for summer cricket coaching camps to be held here in May. The curriculum for the camps has been developed jointly by cricket legend Sachin Tendulkar and the Middlesex County Cricket Club (MCCC) with an objective of providing the very best in cricket education. The camps will be held over four days each from May 2 to May 5 at the MIG Cricket Club, Bandra East, and from May 9 to May 12 at the D.Y. Patil Sports Centre, Navi Mumbai. Under the watchful eyes of MCCC coaches and international players, including Vinod Kambli, the camps will provide young cricketers with a unique opportunity to experience world-class coaching from specialist coaches. At both the venues, the camps will have a morning session for cricketers between the age group of 7 and 12 years while those between 13 and 18 years would attend the afternoon session. Sachin Tendulkar 'Regrets' Missing Alzarri Joseph’s Record-Breaking Bowling Spell During SRH vs MI IPL 2019 Match. Summer vacation was always amazing as it meant that I could play cricket all day long & to my heart's content. The cricketers who performed exceptionally at the camps held last year have also been asked to attend this year's camps to further enhance their cricketing skills. Youngsters with exceptional potentials, who are unable to afford the camp fees, will be provided training free of cost. "Our whole ethos is to draw out and nurture the potential of talented young cricketers. I find it so exciting and rewarding to see them being given an opportunity to further enhance their skills in all aspects of cricket," Tendulkar said in a statement. "The camps last year had an overwhelming response with brilliant feedback from the children and their parents. I'm sure that this year's camps will go even further in fostering and developing the immense young cricketing talent in this country," he added. On the Sidelines of IPL 2019, Legends Sachin Tendulkar and Brian Lara Meetup; Discuss Cricket, Golf and More!